French compaction presses are customized press systems specifically designed for the compaction molding of granular and powdered materials. They are typically integrated with a precision control package to improve the accuracy and parameter control. 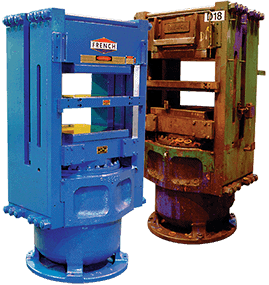 One of our many compaction press systems (pictured at right, below) offers an adjustable tonnage range from 30 to 400 tons and allows accurate control of pressing speed down to 0.1 inch per minute. 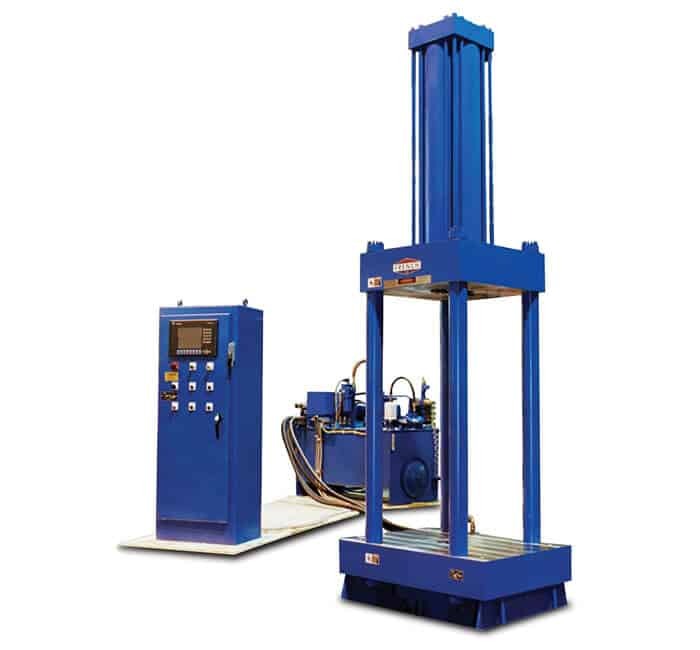 The control system for this press utilizes state-of-the art hydraulic and electronic control components, and a French-developed custom-programming package. Custom proposals are available based on your compacting molding press requirements, learn more about our compaction press capabilities. French presses are well known for their advanced features, rugged durability and standard deflection levels of 0.001 inch per linear foot. These attributes reduce the number of rejected parts, and produce superior quality parts that require fewer costly, time-consuming, post-press finishing operations.